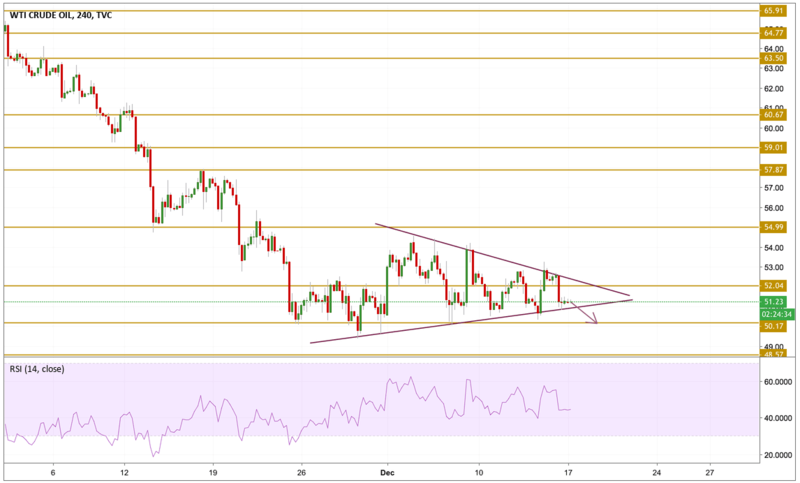 Crude markets continued to trade towards the downside as investors remain unconvinced about impending OPEC+ production cuts as the US continues to overproduce Crude barrels at an incredible rate. Despite OPEC+ agreement to cut oil production by 1.2 million barrels per day, energy traders are waiting to see if the strategic reduction will have an effect on broader markets. With that, broad market fears of an economic slowdown, and oil prices are likely to remain capped in the near term. Oil prices are still trading sideways after failing to settle above the $53 level after breaking above it. Price action is still limited in the pattern presented on the chart with the price hovering just above the lower band and below the $51.5 level. Momentum is still neutral with no clear direction to point out on. We will be focusing on the $50.17 support level and see if the price will break above or below either bands.